DAY 01: PUNO / CHUCUITO / ARAMU MURO / ANAPIA ISLAND: Early departure by car from Puno city along the high plateau to the pier of Punta Hermosa a trip of 03:00 hours and 01:30 hours by motor boat to Anapia Island. On the way we stops at Aramu Muro which is a rock where a door is carved inward, the legend says that Aramu a god pre Inca would have disappeared in this door carved in stone (jayu marka = city of spirits) taking with him a solar disk of the Lemurias, for not to be stolen by the conquerors. 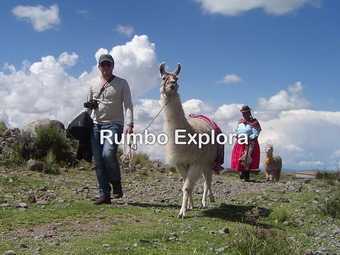 We arrive to yunguyo which is 132 km away from Puno, where we will visit a local market to buy some water or fruits. After a trip of 25 minutes (16 km) we get to the pier of Punta Hermosa from where we will board a motor boat a trip through Lake Titicaca to visit Yuspique Island which is surrounded by terraces and inhabited by vicuñas unique for its fine wool. 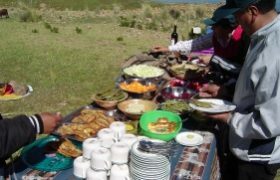 Lunch on the Island prepared by local families. 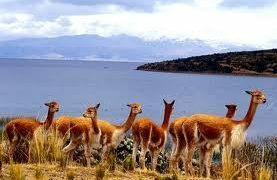 Afterwards we start hiking to the top of the island to observe the wonder of Titicaca and its Andes mountain range and the work system in agriculture. 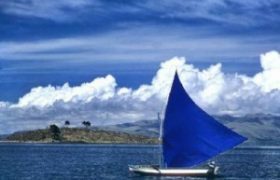 Then we take the local sailing boats to get to Anapia Island which is a unforgettable experience on Lake Titicaca. Anapia is one of the 10 islands of the archipelago of Lake Wiñaymarca Minor, a trip of 1:00 by boat (18 km from Punta Hermosa), where live about 850 inhabitants; the main activities are fishing, agriculture and livestock. In the afternoon we will have some activities about agriculture or fishing techniques, then hiking to the top of the Island, from where you will observe the magnificent sunset on Lake Titicaca surrounded with snowy picks. Overnight on Anapia Island. DAY 02: ANAPIA ISLAND / JULI / PUNO: Breakfast included at guest house. 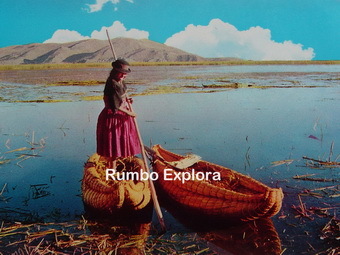 Then a return trip by motor boat from Anapia Island to Punta Hermosa pier, then land transfer to Puno, on the way visiting, Juli a Colonial village, located 79 km away from Puno, known as the little Rome of America, because here came the first missionaries (Dominicans) in 1539 to evangelize to the people, but Juli was part of the kingdom of Lupacas. Juli was founded by the Jesuits in 1565 where was built 4 churches with similar names that in Rome (Italy) such as Saint Peter, Saint Cross, Our Lady of the Assumption and Saint John of Lateran. The Dominicans left the town of Juli in 1574, and then the Spanish brought a splinter of the cross of Jesus and also a printing press (1583) considered the second in America (after Mexico). 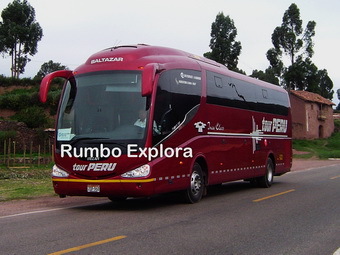 On the way back to Puno we we stops at Chucuito village, which is located 18 km away south of Puno, on the road connecting to Bolivia, this town is known as the city of the royal boxes because it was paid the taxes here in colonial times. Visit the temple of fertility of “Inca uyu” formerly called Temple of the Sun (Inca). In the main square lies a sundial worked in alabaster stone dating from 1610, rebuilt in 1825. In this town existed a jail, in which you can still see its construction in all its originality. In addition Chucuito has a fish farm (an experimental center of the National University of Altiplano). Overnight in Puno. WHAT IS INCLUDED: The prices INCLUDE round trip land transportation, private tour guide for 02Days, round trip regular motor boat, lunch on Yuspique Island US$10, sail boat ride US$15, meals & accommodation US$45, entrance fees to fertility temple in Chucuito village, entrance fees to Aramu Muro Doorway (local community), colonial church in Juli village, colonial church in Pomata village. Besides pre-trip information + organization and all local taxes. There are no hidden extras in our prices. The regular motor boat has 25 comfortable seats, velocity 8 knots + night navigation lights + oxygen & first aid kit + life jackets + panoramic windows. Share the post "Tour Anapia Island + Fishing – 02 Days"